A record 152 VWs set off in convoy from Beaulieu to deliver Christmas presents to youngsters at the Piam Brown unit at Southampton General Hospital. Lord Montagu waved the chequered flag for the start of the biggest ever VW Santa Run with nearly 400 participants entering into the Christmas spirit on Sunday 2 December. They dressed up in festive costumes and covered their VWs with wacky seasonal decorations. Classic split-screen and bay-window VW T2 campers were joined by their modern van and motorhome counterparts to fill the Beaulieu Events Arena, along with Beetles and even trikes with VW-engines. Accompanied on their journey by a team of motorcycle out-riders for their sixth annual convoy from Beaulieu, the colourful VWs delivered hundreds of donated gifts to the unit for children and teenagers with cancer and haematological disorders, with enough presents for hospital doctors and nurses too. At the start-line, Lord Montagu gave prizes for the best dressed van and family. The coveted best dressed family prize was won by a collaboration of two families. 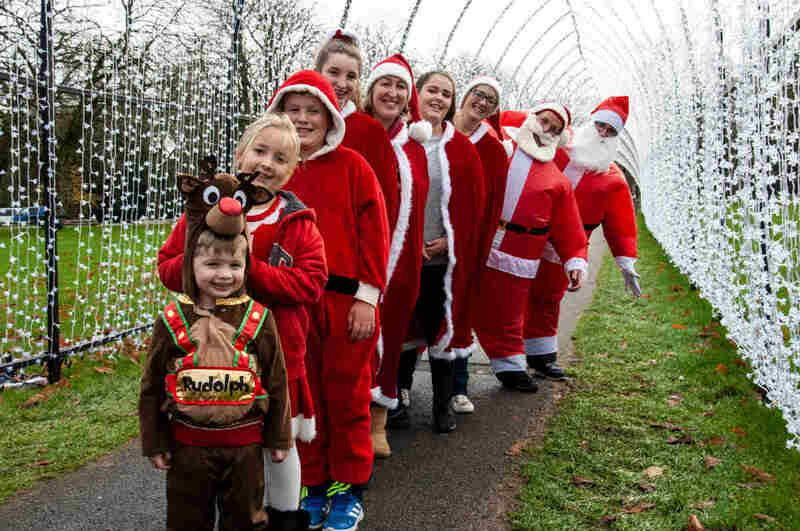 Austen, Nicky, Aoife, Fintan and Orlagh of the Hornsby family from Yateley near Farnborough, joined forces with David, Christy, Lucy and Ollie of the Court family from Farnborough, to create a team of eight Santas and one Rudolf. The best dressed van went to Steve Wright and his family, who had set off from Bristol early that morning in their 2003 VW T4 van decorated with thousands of fairy lights. Appropriately, Lord Montagu presented both sets of winners with their prizes of Beaulieu biscuits and fudge, plus a VW plaque, in front of the Christmas at Beaulieu Cathedral of light tunnel on the illuminated festive trail. A three-year-old cockapoo, Max, from Camberley, won the best dressed dog award. Beaulieu continues its festive celebration with the first Christmas at Beaulieu light trail in the grounds of the attraction until 24 December. A traditional Victorian Christmas can be enjoyed at the Palace House from 22 December to 6 January.